I love photography, and have since I got my first SLR in high school in the 1970's. When I moved to a DSLR a decade ago, I re-discovered the joy of photography, along with the joy of not having to buy film and pay to process the images! For me, photography is a rewarding hobby and I love seeing people’s faces light up with joy or encouragement when they see my work! Photography as a work of art connects with the heart of the viewer. I like to think that my photography has "soul." That's why I normally watermark my photos with "TGBTG," "to God be the glory." My scenic and landscape photography attempts to capture the beauty of God's creation, something I can steward, but can't improve upon. So it may not surprise you to know that in my regular job, I am an ordained minister and associate network leader with the Northwest Ministry Network in the Seattle area, serving more nearly 350 churches and 1400 ministers in our network covering Washington and North Idaho. After spending more than 25 years in local church pastoral ministry, my current passions include teaching, speaking, strengthening the mission of the church, engaging young/emerging leaders, and coaching pastors. 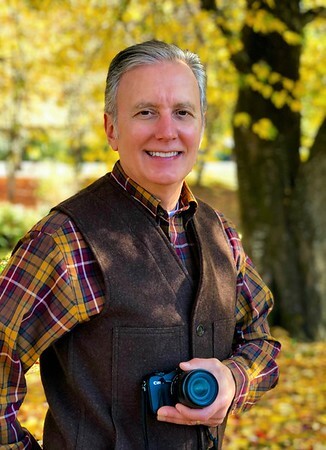 Besides photography, I love to write, and have published numerous articles and a book, Growing Disciples Organically: The Jesus Method of Spiritual Formation (Deep River Books, 2013 available on amazon.com). Education-wise, I earned a D.Min. in leadership at Evangel University's Seminary, an M.A. in counseling from Luther Rice Seminary, and a B.S. in pastoral ministries from New Hope Christian College (formerly Eugene Bible College). I also love being an adjunct professor at Northwest University (Kirkland, WA) and The AGTS Seminary at Evangel University (Springfield, MO). I have been married to the beautiful, talented, and vivacious Jodi Detrick for more than 40 years, and we have 3 children and 3 grandchildren. Jodi is the author of the best selling book, “The Jesus-Hearted Woman,” the former national chairperson for the Women in Ministry Network, a former columnist for the Seattle Times, and is a national and international conference speaker and life coach. I love spending time with Jodi and my family. Besides photography, my other hobbies include restoring and collecting antiques, bonsai, reading, writing, and riding my Yamaha TW200 in the hills.